Back in October, I attempted to make Calendula by Hélène Rush with my handspun Purple Llama yarn and blogged about it here. The yarn wasn’t well-suited to the pattern, so I moved on to a different project for the yarn and set the pattern aside. Throughout the fall, the pattern kept calling to me. My online shopping brought me to Plymouth Yarn Company’s Nettle Grove in the colorway 31 Seashell, which is a blend of ivory, beige and sky blue. The yarn is made from 45% cotton, 28% linen, 15% silk and 12% nettle fiber. Based on the pattern's suggested yarn, I would need up to 1,092 yards (998.5 meters) to make the 40-inch (101.5 cm) top with no changes. Five balls of Nettle Grove equal 1,090 yards (almost 997 meters). Thinking about how I cut it close on yardage with too many projects in the past year, I added a sixth ball to my order. In mid-December, I finally cast on and found the pattern to be straightforward. 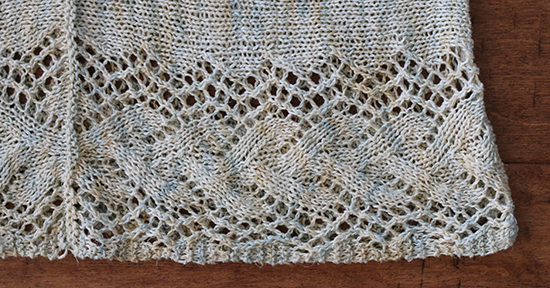 Between the stockinette body and the lace details, the knitting is interesting without being difficult. The only change I needed to make was to work on US-6 (4 mm) needles to obtain gauge. And, no, I didn’t need that sixth ball of yarn. The construction starts at the end of each sleeve and works toward the center of the body, to be joined with a three-needle bind-off. Sewn seams are worked under the arms and down the sides. 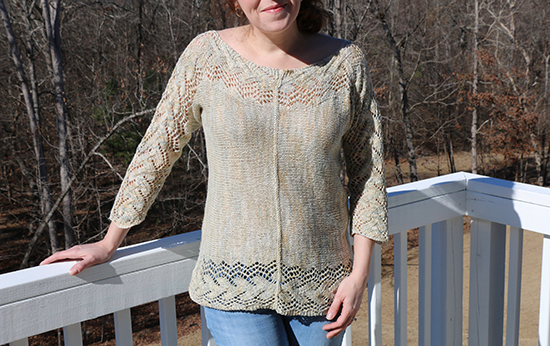 While I'm very happy with the top, it doesn’t drape as well as I hoped. Part of that may be due to the construction, but I suspect the primary culprit is the yarn. It has a slight stiffness to it that relaxed a little after an initial soak. I think that with use — and maybe a quick tumble in the dryer — the fibers will continue to soften. The weather is warming up enough that I can start wearing Calendula right away. My project timing is improving! Now the big question: What to make with one ball of cotton/linen/silk/nettle yarn? Edited to add: After a full day of wear, the yarn has softened considerably and the top now drapes beautifully! A beautiful sweater, I am sure you will get a lot of wear from it. The lace detail is so pretty. That is so beautiful, I love the lace details. Thank you, Jenny! The lace details are what drew me in to the pattern. Gorgeous sweater!! You certainly did that pattern justice. Thank you! The pattern itself made it easy. 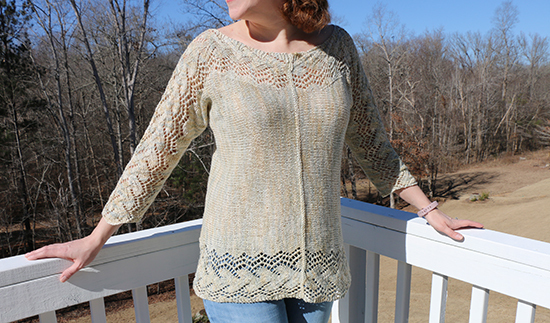 Beautiful sweater, love the lace details and the cables. Thank you! It's actually easier than cables; the effect is from well-placed increases and decreases.